I recently had the privilege of spending an overnight with a sect of Old Order Mennonites in Belize, Central America, where I was living. A surprise to most, there are several Mennonite communities in Belize that are very similar to the Amish in the United States. They speak their own dialects of German (“low German” and “Pennsylvania Dutch”), and have close-knit communities with their own unique dress and style of living, horse and buggies included. They settled in Belize in the 1950s after coming from Mexico, and before that the U.S, and even before that, Germany. The Old Order Mennonites have managed to preserve a distinct culture, religion, and way of life despite the climate and culture of Belize. Most semesters at the study abroad program where I worked, we took the students and staff for an overnight with a Mennonite family. The first semester, I had to miss the trip. However, the students and my husband Josh did participate. Josh stayed with a family (we’ll call the husband “John,” and the wife “Sarah,” for privacy’s sake) with whom he stayed in touch by writing letters to the husband. I was excited when it was time for the overnight the next semester and I could meet and stay with John and Sarah. When we arrived, we were picked up at the church by John, and hopped into his horse-drawn cart for the short, but bumpy, ride through the hills on a dirt road to their house. The cart had no roof, so we pulled out an umbrella quickly as it started pouring. We trotted into John and Sarah’s driveway, watching seven children in miniature adult Mennonite clothing scatter, shyly peering from inside the house at these strange guests. We tried to fit in a little, but we still stuck out quite obviously. When with the Mennonites, we try to dress similarly to them, out of respect for their culture. So I awkwardly donned a gray skirt that was so long I often stepped on it, and an over sized beige button-down shirt, which was quite toasty in the 100+ degree weather. I also wore socks with my Crocks (I know, a faux pas) to cover up my foot tattoo, which would surely be disapproved of. Sarah greeted us, and Josh and I went our separate ways. I went with Sarah and the children, and Josh with John in the field. I watched as Sarah went about her daily chores, running a household of nine. I thought She seems about my age, maybe a little older, and she has 7 children already! Children are seen as a blessing and they believe in using no methods to prevent pregnancy, regardless of the size of the family. The bigger the family, the better! Sarah told me about the joys and challenges of raising children, and it became clear how everyone took care of each other. The oldest, about 12, helped her mom around the house and cared for the younger ones. Whenever Sarah was sick and couldn’t fulfill all her household duties, other women in the community were there to fill in the gaps - cooking, cleaning, and helping to care for the children. Though having seven children seemed overwhelming to me, the community made it possible to raise them well in a healthy way. Not only that, but compared to my way of life, their lives were clearly simpler, which is an important value to the Mennonites. They had no electricity, no cell phones, no computers, not even flashlights. Social media was taking up none of their time. To communicate with others further away (including us), they use old-fashioned letter writing. The kids had no digital devices. They played in a homemade sandbox, running around the yard in bare feet, carefree and giggling. They all piled into a wheelbarrow (yes, all seven of them!) and cuddled, the older ones giving the younger ones rides. I told Sarah how impressed I was with the way they played together, and she said, “Well, they aren’t always quite like that.” She told me there was a need to discipline them from time to time, and she seemed to do so in a very loving way. The family also lived very close to the land, depending on it for a mutual relationship. The children went with their father to the farm at a young age, helping to seed and plant, or sometimes just to tag along and watch. They grew up running around their yard, enjoying fresh mangoes and breadfruit from the trees out back, watching birds land close by, and orchids grow. Most of their provisions came from their own land and their own community. Sarah’s pantry reminded me of a pin I would envy on Pinterest. It was a large walk-in closet filled with brightly colored Ball jars. She had me guess what each one was - canned mangoes that were bright orange (and delicious! ), multi-colored vegetable soup, deep red spaghetti sauce, white cauliflower, purplish red cabbage. That night, we ate a hearty meal of cabbage soup, pasta with spaghetti sauce, homemade bread with freshly made butter, coleslaw,, and a dessert of fresh coconut pie with canned mangoes on the side. The deep faith of the family was evident as well. Prayer was a routine part of their lives as a family - at dinnertime, before bedtime, in the morning. Sometimes it was several moments of silence before a meal, and other times it was led by a family member. They knew their Scripture and integrated it into their conversations. Faith was a gentle stream flowing through the family - it was there, present, life-giving, but also second-nature. 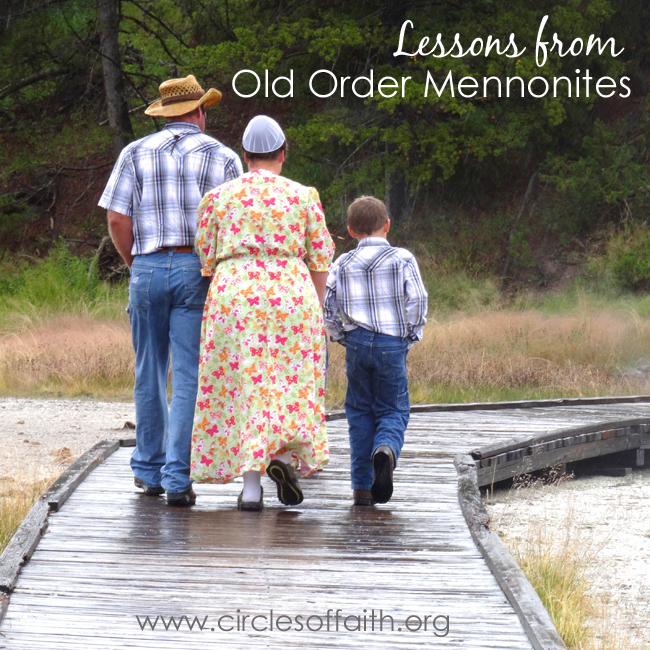 Though I do not agree with all of the Mennonite beliefs (particularly their stance on women’s inequality with men), there is much to learn from them and their lifestyle. Even though we may have different beliefs on certain topics. I gained much from the ways the Mennonites cared for one another, their simplicity of life, and their faith. I look forward to continuing a friendship with faithful people who live very differently from me, but are willing to open their homes and lives to us.